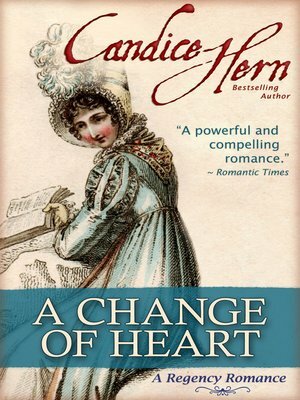 Fans of the traditional Regency Romances of Georgette Heyer and the more emotional Regencies of Mary Balogh will enjoy this unforgettable romance from New York Times bestselling author Candice Hern. Jack Raeburn, a longtime pleasure-seeking rakehell, is now unexpectedly the Marquess of Pemerton, a title inherited after the tragic deaths of his father and older brothers. Unfortunately, he inherited a mountain of debts along with the title, and believes his only option is to marry an heiress. He finds a surprising champion in Lady Mary Haviland, a spinster of unremarkable looks and a charming personality, who has decided to help him find a bride. When Jack discovers that Mary has a large fortune, their comfortable friendship takes an unexpected new direction. By turns witty and emotional, A CHANGE OF HEART follows the path of two wounded souls from friendship to betrayal to redemption. The ballrooms of London and the rugged cliffs and coves of the South Devon coast come alive in this poignant tale of the healing power of love.